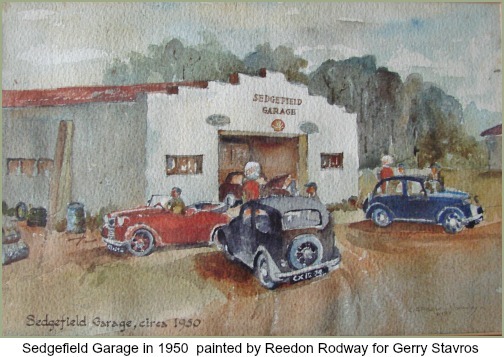 In 1973, Reedon Rodway, a watercolourist of distinction retired to Sedgefield together with his wife, Kay. Born in Glocestershire, his artistic ability was recognised by pupils and teachers in his school days at the Cheltenham College of Art. 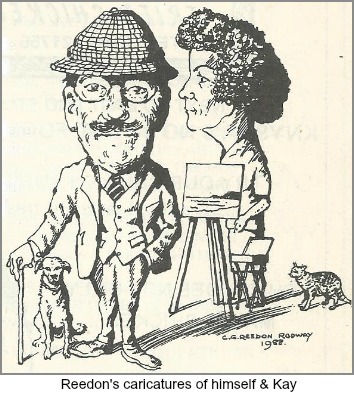 Reedon’s speciality was his identifiable caricatures of them. 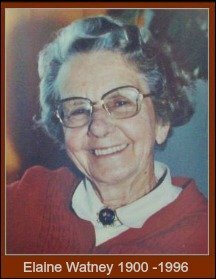 He was once commissioned by the landlord of an old inn in the Cotswolds to produce coloured sketches of 50 of his regular patrons. Thereafter, the flattering report of a roving Fleet Street columnist established the Plough Inn as a popular weekend rendezvous. 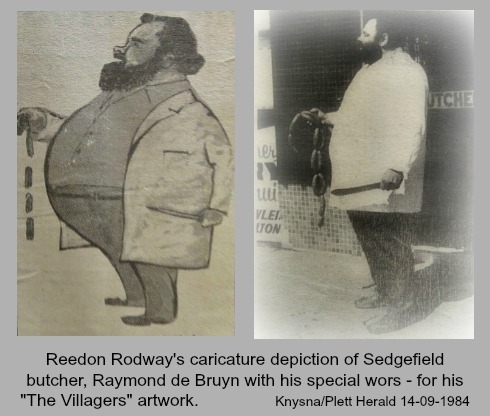 Reedon Rodway however, made a living as an architectural interior designer in London. 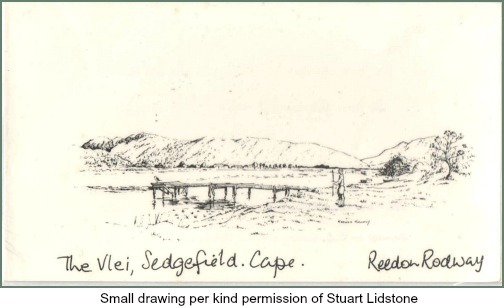 He had trained at the largest and most famous architectural drawing office in Britain. In the hey-dey of plush super-cinemas, he designed, amongst others, the auditorium of the Gaumont Theatre in Haymarket and once designed a multi-storey leisure paradise for an American millionaire senator. He invented a device that enabled architectural drawings to be executed quickly and accurately. 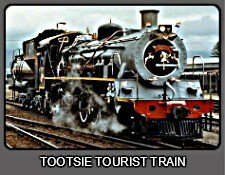 Later this was patented and marketed but he had the original in Sedgefield. During World War II he served in the geographical section of the war office. Later as an officer in the Duke of Cornwall’s Light Infantry he was posted to Northern Rhodeisa (Zambia). 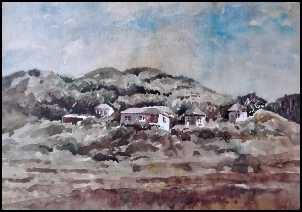 Eventually in 1952 because of earlier years in Africa, he joined the colonial service in Northern Rhodesia as a Tourist Officer in the Information Department. Travelling widely with his wife, Kay he was able to make time to write and illustrate publicity material, press releases and articles for media consumption all over the world. 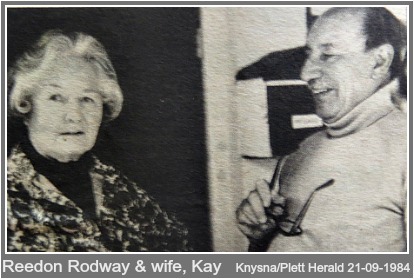 The Rodways were an integral part of the fairly hectic social life that was characteristic of colonials living in foreign countries – sports, parties and a high standard of theatrical productions. 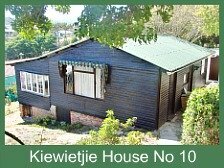 In 1958 he was seconded to the Ministry of Foreign Affairs and posted to South Africa. After the stipulated 2 years was up he went on to a post in Southern Rhodesia (Zimbabwe) where he was appointed P.R.O to the Ministry of Agriculture. Among other things he was also put in charge of English language broadcasting for the Ministry of Rural Development. 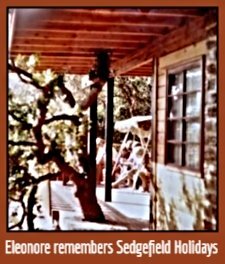 He and his wife retired to England in 1971 but the warmth and blue skies brought him back to Africa in 1973, to a small village called Sedgefield on the Garden Route. Why? 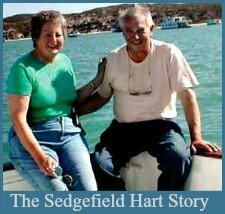 The deciding factor had been the memorable time he had experienced some years earlier whilst staying with Roger Lidstone at Lake Pleasant. 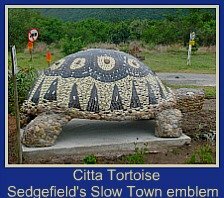 In Sedgefield he soon became a popular presence in jacket and hat being towed around the village by a friendly brown dog. 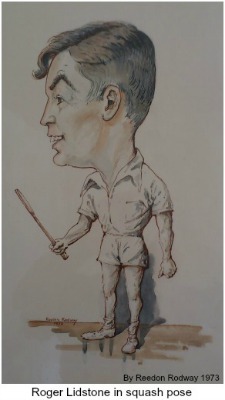 He surreptitiously sketched impressions at meetings such as Ratepayers and the like and it wasn't long before caricatures emerged, that had been drawn in pen and water-colour. 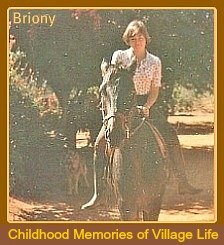 They are easily identifiable, local characters, about 100 of them, that are now recorded for posterity in a magnificent series entitled ‘The Villagers”. These currently hang in the main hall of the Sports Club on the Island. 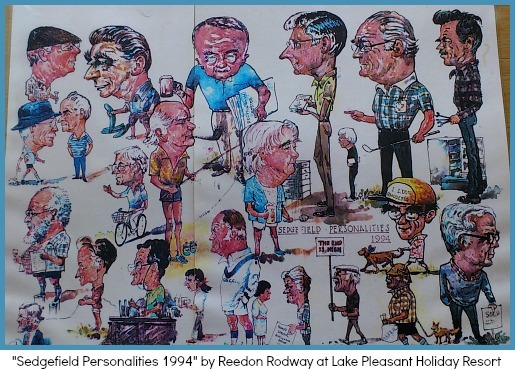 Roger subsequently had his own collage of characters sketched by Reedon, namely "Sedgefield Characters 1994". 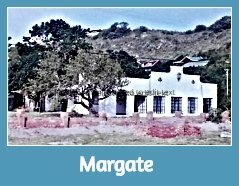 I am sure some are still recognisable to those residents who have lived here since the late 80's and early 90's. 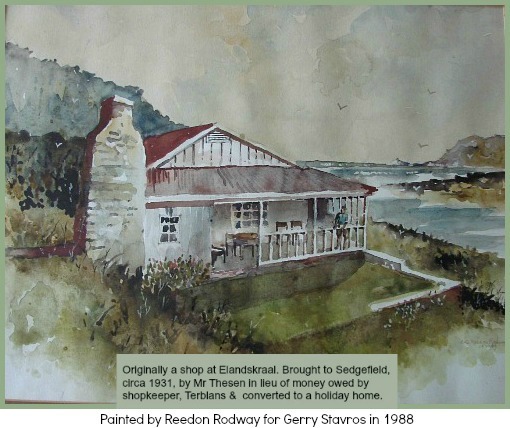 Gerry Stavros who owns the Forest Lodge complex also commissioned Reedon to paint some pictures of notable Sedgefield places that were disappearing as time went by. Some that had already gone Reedon painted from old photos. 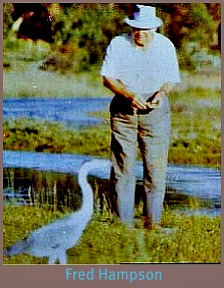 Gerry lived on a small-holding on Wilderness Heights for some time where I visited him and he allowed me to take photographs of them. 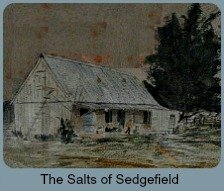 He has since returned to live in Sedgefield again. He has those pictures still. 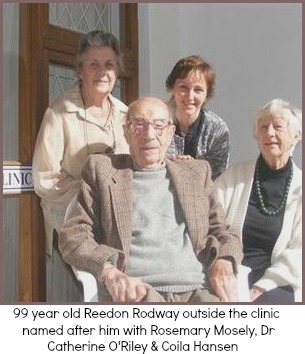 Reedon Rodway’s last years were spent at Murray House in George where he was a beloved and respected resident. 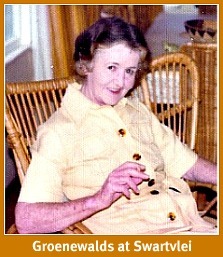 He died at age 99 on 15 March 2011. 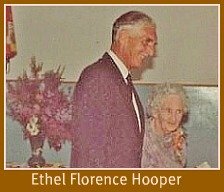 In appreciation of the care that he received from the nursing sisters and residents, he had meticulously drafted a codicil to his will in his own handwriting in order to make a contribution to the nursing service facilities. It was faxed to his nominated executors but on his death, the original could not be found. In terms of legal presumption and the formalities required in terms of the Wills Act, the codicil was ruled by the Master of the High Court and the executors to be invalid. 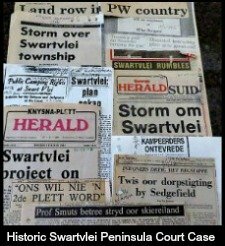 However Attorney, Neil Haycock was then consulted who kindly took the matter upon himself and made an application to the High Court to have the codicil declared valid. 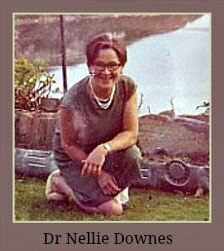 This was accepted and the money received was able to be allocated towards the Reedon Rodway Clinic that was named after Rodway who will always be fondly remembered for his generosity.